Rotary and Centrifugal Feeders: A Viable Alternative to Vibratory Bowl Feeders? Many times, it is said that though Vibratory Bowl Feeders have been around since the early part of the Twentieth Century. Till date no major alternative for the same has been invented. However, a Rotary or Centrifugal Feeder which uses a motorized drive is definitely an alternative. There are many advantages of Rotary Feeders vis a vis vibratory bowl feeders, the major one being the speed or feed rate. Rotary or Centrifugal Feeders work at very high speeds and one can achieve a total feed rate of up to 50 meters per minute as against just about 12 meters per minute in case of even high speed vibratory bowl feeders. Secondly, there being no vibrations and only mechanical items, rotary feeders are more acceptable to a lot of customers who are afraid of the reliability of vibratory bowl feeders in the long run (however, using a vibratory bowl feeder from a reliable supplier like Elscint can reduce this inhibition). However, the major drawback of a Rotary or Centrifugal Feeder is that it is not possible to orient a lot of parts in it, especially due to the fact that there are no vibrations and the movement of the parts is very fast. Further, in most of the cases, air jets are required for orientation, while in a vibratory bowl feeder, air jets are required only occasionally. Thus the running cost of a Rotary Feeder is always costly compared to a vibratory bowl feeder. Another disadvantage of a Rotary feeder is that due to the positive pressure generated because of the rotating disc, the parts being fed are thrown against each other and against the wall of the feeder. This can result in damages to the parts. However, in a properly manufactured Rotary Feeder, this can certainly be avoided. Against this components or parts do not get damaged at all in a vibratory bowl feeder. Even brittle and delicate parts can be handled in a vibratory bowl feeder. One more disadvantage of a Rotary Feeder is that the number of components which are loaded in a Rotary or Centrifugal Feeder have to be limited to ensure there is no jamming or blockage. Hence, invariably a stock hopper or a hopper elevator is required in order to replenish the Rotary Feeder on a regular basis. This adds to the cost of a Rotary Feeder. Manufacturing of a Rotary or Centrifugal Feeder also requires a lot of expertise, which few posses and most manufactured Rotary Feeders are quite crude and result in jamming and damage to the components being fed. 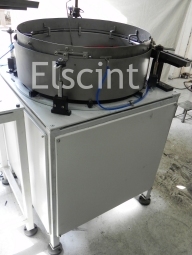 However, the Elscint Rotary / Centrifugal Feeders have a very unique design which is rugged and highly robust for feeding of parts which require high speed feeding. The build quality too is excellent with all the components touching parts being made in stainless steel. Elscint uses a dual drive for its Rotary Feeders. Three Phase AC Geared Motors of Elscint Make are used for this purpose. Standard units come with a Variable Frequency Drive (VFD) so that variable speed can be offered, which helps adjust the feeding speed according to the actual requirement of the user. A lot of parts, even those requiring orientation can be fed through a Rotary Feeder like bottle caps, cylindrical rollers, needle rollers, flat and cylindrical drippers, bearing races, bearing rings etc. Even parts requiring critical component orientation can be oriented and fed through the unique double disc design of the Elscint Rotary Feeders at a high speed. However, orientation in a Rotary Feeder may not be possible for some parts and in such cases; one has to opt for a vibratory bowl feeder. In fact, Elscint recently manufactured a Rotary feeder for flat drippers where the curved face was required to be up. A speed of 800 parts per minute was achieved for this 40 mm long flat dripper as against this, we could achieve a speed of just 200 parts per minute in case of a vibratory bowl feeder for the same component (for a different application where the speed requirement was much less). Usually one rotary feeder is made for one type of parts. However, in case of need, changeover tooling can be provided so as to accommodate more type of parts, making it very versatile. Zycon is a rapidly growing online industrial directory, engineering resource, and vertical search engine that directly targets buyers and sellers in the industrial, manufacturing, contract manufacturing and distribution sectors worldwide. Zycon specifically offers a user-focused web site design, reducing the navigational steps required to find the products, companies, distributors and services worldwide that directly meet your needs. Find us on Facebook, Twitter, and Google+. Do you prefer Google, Bing, or another search engine?